Who was Behind the Killing of Ambassador Karlov? Poser directed by John Badham. Who, if anyone, directed Altintas? So, as we've all heard, an off-duty Turkish riot policeman named Mevlut Mert Altintas (WP) recently killed Russia's ambassador to Turkey, Andrei Karlov (WP), then died in a firefight with the police. The assassin's name, if not his victim's, is briefly a household one, and certainly his image in the iconic AP photo is now widely known. (I couldn't find a copy, had to use this similar image as a stand-in... well, I had to anyway). He's iconic, I guess, of the threat of Sunni extremist terrorism, and perhaps Turkish ultra-nationalism. Don't let the clean-shaven chin fool you. This is the mindset of an ISIS terrorist. Speaking to the world at large, he told reporters after the killing “as long as our lands are not safe (meaning occupied by Islamists – he was referring to their loss of east Aleppo), you will not taste safety.” He was talking to you, and me, and everyone else. He may have inspired some others. Consider: Altintas killed Karlov on December 19 around 8:15 PM in Turkey (or perhaps 7:15, I've heard both). At 8:02 PM in Germany - that is, about an hour or two later - a claimed ISIS terror attack killed 12 and wounded dozens at a market in Berlin. The two lining up like that helped clarify (at least to most people) Altintas was a terrorist-type to detest, more than a hero for Aleppo's people, or in the great struggle against Russia. That coincidence could be nothing but one, or someone inspired by the comments to remove some safety, or perhaps even a coordinated two-part event. The details of who was behind each crime matter greatly, perhaps even more so in tandem. But here, we will deal only with the man photographed in the act, not the one who allegedly left his ID papers under the seat of a stolen truck before “fleeing” (mysteries to be resolved elsewhere...) Here we ask who, if anyone, directed the actions of the assassin Altintas. As usual, this is (will be) a little long. The most important parts, I think, are in the last section. Erdogan is currently trying to purge all suspected Gulenists from the government and society, calling them terrorists, and blaming everything bad on them as an excuse to do that, like the supposed coup attempt in July (see below). Gulen denied involvement in that, as well as the assassination of ambassador Karlov. Erdogan has even blamed Gulen infiltrators for shooting down the Russian fighter jet on the Syrian border, even though that explains nothing at all about that terrible provocation. Erdogan now insists he's totally sorry those guys shot down Russia's jet, and that the same have now killed their ambassador, and will do whatever might happen next. Arrests will always follow. The purge must continue. There have been some words and even moves from Turkey that fit with that impression of friendly new relations with Russia, but the sincerity of those moves is unclear, given their black history in the Syrian conflict. Erdogan and his ruling AKP party may just be playing a pro-Russia game, hoping to gain fresh leverage with their cooling Western partners. They recently declared support for Syria's territorial integrity in agreement with Russia and Iran, on the same day as their latest failed effort to steal the city of Bab (near Aleppo) from one proxy (ISIS) with the help of other “moderate Islamist” proxies. And it seems highly unlikely Altintas was a Gulenist. This network has recently been dubbed FETO - (Fethallist Extremist Terrorist Organization) by Turkish authorities. Erdogan says there's "no use hiding” that Altintas is a FETO member, meaning they're not the moderates they claim to be, and that the police need to be purged some more. By by public stances anyway Gulen and those he would organize would – presumably, – be mainstream Turkish nationalist, neither leftists nor fans of Kurdish aspirations, Islamic by definition and maybe even Islamist, but with an emphasis on democracy, secular elements, modern education, respect for (or “dialog with”) non-Sunnis, non-Muslims, and even atheists. Gulen opposes Sunni extremism, and Erdogan's Syria intervention, which uses it as a weapon. Whereas publicly, Erdogan denigrates other religions, backs, arms, and harbors genocidal Sunni terrorist groups in Syria, and spreads their lies about the Syrian and Russian governments. He's laid claim to land in Iraq and Syria, taking advantage of the chaos he largely engineered there to try and seize some. At home, he gathers more power for himself and whittles away at all competitors and democracy itself, behaving, it's increasingly said, like an Ottoman sultan of old. Altintas appears to be an Islamist angered at the Turkish-backed terrorist groups' loss of East Aleppo. Now which category seems a better fit? But to me, the act seems too convincing by a few degrees. That would be fanatically good method acting - especially the part where he died. This seems more like a true-life AKP Jihadist. * I don't feel like re-writing the above, but thanks to my friend CE, I can put this in better context. The main carriers of Turkey's secular tradition are called Kemalists. These may be behind more of the challenges to Erdogan, and seen as the bigger threat. Gulenists are still Islamists, once linked with Erdogan. Though they still seem to be the moderates among them, they could just be the outsiders. And the Gulen network could well be a CIA tool, and it could also barely matter, with the main fight really being Erdogan vs. the Kemalists. Altintas is alleged to be part of FETO, which seems to be a fictional boogeyman - in fact FETO could be taken as an acronym for Foes of Erdogan Targeted for Obliteration. Kemalists, Gulenists, and others are all framed as one giant conspiracy. Kemalists are named after modern Turkey's founder, Kemal Ataturk, whom Erdogan also claims to admire. So maybe that's why he chose to put it all under another Islamist umbrella and not even mention those other guys. The moderate/secular aspects of Gulenism could explain that kind of activity, and the Islamist/CIA part might explain Altintas or any other byproduct of Erdogan's rule. Having clarified that, the rest of the article below stands. The assassin's FETO links aren't just claimed but supported by claimed evidence. However, it's not very convincing. Classes, Literature, Links: An AP report quoted Erdogan saying of Altentas' Gulen links: "from the places he was raised to his connections - that's what they point at." But it seems the better translation for “raised” would be “educated.” German DW quotes the President saying “All his connections, from where he was educated to his links, point to FETO," adding that he took some classes at a school associated with the Gulen foundation. (DW) The person who got him into the school was also linked, some have noted as if it meant much. For all we know his family pressed him into it, he was just taking some extra-good classes, or he was there as a spy for Erdogan. Pro-government media reported police found pro-Gulen literature that belonged to Altintas. He also had acquaintances who were Gulen sympathizers (DW) This could be planted, or maybe he was doing opposition research. He's also said to have lived with a lawyer suspected of being Kurdish, suggesting a Gulenist-Kurdish network against AKP's Turkey (Telegraph) But this is extremely speculative and raises as many questions as it tries to answer (and if this lawyer has the initials S.O., he might be a jihadist - see below). Altıntaş reportedly took a report of absence for two days after the thwarted coup, even though all police officers were called to duty after July 15. He was on duty in the southeastern province of Diyarbakır on July 15, but arrived in Ankara on July 16 after obtaining a leave of absence. He stayed in a house in the Demetevler district of the Turkish capital, daily Habertürk reported. Two days including the 15th, or two days after, or officials also told Reuters his leave was three days, July 15-17, and FoxNews reports “the government could assert this showed Altintas knew about the coup attempt beforehand,” reports It's also reported he bought the ticket the 15th, so he must have known by then – but they say he wasn't in Ankara for the main show, travelling there perhaps late on the 15th,, meaning to be part of some second wave, but just as the effort was failing. Hurriyet reports “The police chief who allowed him to take the leave of absence, Kahraman Sezer, was arrested after the failed coup attempt over links to the U.S.-based Islamic preacher Fethullah Gülen.” That suggests he was in on it, and the guy he sent … “Altıntaş himself was suspended over suspected links to FETÖ on Oct. 4 but was returned to duty on Nov. 16.” He was apparently cleared of suspicion then, at the time. One month later, he shot ambassador Karlov in what they pose as an obvious Gulen plot. This doesn't seem to add up very well. My own initial feeling was this: no one deliberately set this up to blame anyone else. If anyone had, it would more likely be the Erdogan side. But if that were the case, it seems to me they'd have clearer connections and better evidence, instead of relying on the evidence panned above, and having to clumsily arrest his entire family, as if to be sure they all get the story right and "prove" a Gulen link (DW reports 11 family members and friends taken in - I predict they will help illustrate the desired link, or be said to help and that will be close enough). This looks more like a case of one of Erdogan's own goons (see below) gone amok; he drank a fatal dose of kool-aid, dyed with his own true colors. His crime may line up with the sultan's plans, or complicate them, depending. I don't know what Erdogan's true plans are. If it lines up, obviously some help or direction is still worth considering. But I suspect not. In the regard that Erdogan is behind this Islamist and ultra-nationalist menace, at least, he's behind the killing. No one did it to make Erdogans look bad. Erdogan and his fanatical followers just are bad, and this guy shows them for who they are, with no plotting required. Douglas Burton, Free Beacon points out how al-Nusra swore to avenge their loss of Aleppo, and seemingly took credit for this. “However," he notes, "Abu Maria al Qahtani, a member of the Shura Council of Fateh al Sham, disavowed the claim, denying his group’s involvement in the assassination, according to Daesh Daily, a war digest.” So they've reportedly claimed and denied it. For all we know, they did it and the denial was simply backpedaling after an angry phone call from Erdogan. Or perhaps they really had no part, and Altintas just directed himself. But he did invoke their motto, which could confirm the claim or at least some connection. This could mean Turkish cop Altintas had al-Qaeda/al-Nusra links, of a serious and actionable sort, obviously. Would this be in addition to the Gulen links, or instead of them? There are the clues suggesting Gulen links, but even more clues Altintas was a supporter or even a direct armed element of the Erdogan camp, secret operations division. Where Mevlut Mert Altintas was “raised” was cited, in an (apparent mistranslation), as sign of Gulen links. But in fact it's a weak clue to the contrary. He was born and raised in Söke and, as the UK Telegraph reported, “While Turkey’s western provinces are renowned for their open, more liberal politics, in Söke, the graffiti of right-wing ultra-nationalists mars the walls.” His family was reportedly somewhat secular and pro-Gulen, but the boy would grow up surrounded by conflicting messages. He could turn out different ways, depending. According to Hürriyet, lawyer S.Ö. And Altıntaş met in Ankara during the conversations of Nurettin Yildiz. Accordingly, S.Ö., SB and Altıntaş were attending conversations of Nurettin Yıldız in Hacı Bayram Mosque in a house in Etlik and Batıkent in Ankara. More direct would be his contacts with Islamists running militias in Syria. Altintas reportedly contacted Murat Oduncu, from a Salafi group called 'Kurtuba Youth Movement' in Syria. Twitter messages reportedly show Altintas sparked contact, and they met and talked. As Google-translated, and as I could make sense of that, Diken reports Altintas wanted to leave police duty and take an active role fighting in Syria. Oduncu noted the future assassin was “very young and had psychological problems,” and scolded him for having gone to a Gulen-linked school. Nonetheless, he advised the lad on a path to martyrdom in Syria; 'enter the Special Operations'. At the time of Karlov's killing, Altintas was reportedly part of the “elite special operations unit," and these tweets and the account were reportedly deleted. But perhaps the most interesting lead relates to his alleged coup involvement. Hurriyet, close to Turkish authorities, says Altintas might have helped in this, after he called in sick from work - just like he did the day he shot the ambassador. It's implied this might be relevant, as in there was no innocent reason proven. He might have been doing coup work, they now think. Really now? Because back then … even with that shady absence on record and the other supposedly obvious signs, the aggressive dragnet of military, police, government, and civil society that took in tens of thousands did not manage to nab Altintas? He was briefly suspended they say in October-November on suspicion, but he had that cleared and was reinstated in time to use his authority to bypass security screens and shoot Russia's ambassador dead. But authorities insist he was or might have been doing coup work. Could it be the authorities know just what he did in mid-July, and it was just that, and they never arrested him because they approved of his work? Yes, it's quite possible. The timeline confusion might matter: did he really arrive in Ankara only on the 16th? Or is this one alibi authorities still want him to have? Let's pause to re-consider this alleged coup. In retrospect, it did nothing but be provocative and then fail badly, allowing a massive and useful retribution from a newly-empowered Erdogan. There might have been a genuine coup attempt, but those promoting the idea seem to be guessing and leaping to blame Gulen and thus the CIA. As far as I could tell from middling study, it seems all evidence for this 'coup' could be explained by a few armed fakers in a TV studio, a few in one "rogue" helicopter and perhaps a couple of jets, some social media forgeries, and a few unseen snipers. That is, besides a number of hapless and unarmed soldiers sent out on the streets, as they said, on a suspiciously timed "exercise." The rest is Erdogan miraculously surviving, with re-invigorated supporters, and a ready list of domestic rivals to blame and get rid of: suspected Geulenists, Kurds, leftists, maybe Armenians, etc. Probably zero Allahu Akbarking Islamists like Mr. Altintas were put in the pound in that sweep. Those in fact tended to be in the pro-Erdogan mobs assailing, murdering, even beheading soldiers they caught. And they would be the ones running any fakery that allowed that spree. If Altintas was involved in helping spark Erdogan's purge, we can see how this would shed some light on what really did happen in those murky days. There was probably some role in this for riot cops (I don't know many of the details). If there was a scene where any of them behaved obnoxiously, shouted Marxist slogans and then killed a woman, or something to that effect, my suspicion is Mr. Altintas was one of them. And like all the provocateurs, was never arrested, but instead remained free, protected, and perhaps newly-favored; he might even show signs of being rewarded in the following period. Moving Up the Ladder of Trust? According to a neighbours and the brother of Altintas’ landlord, the young police officer moved out shortly after the coup attempt that rocked Turkey in July, selling all his possessions before he departed. His next home was an apartment on a cul-de-sac in the poor, densely populated northern suburb of Keçiören. Like Söke, the neighbourhood has a reputation for nationalism. Who would sell all his possessions just to move to nearby suburb? One reason might be: the new place would be furnished with better stuff, or his pay was set to increase so he could upgrade and the old crap wasn't worth moving. That is, somehow or other, he was stepping up. The neighborhood wasn't rich, but the apartment might have been posh. He apparently already worked for the elite special operations unit, but might have been moving up within it. Douglas Burton spoke with Ahmet Yayla. the former head of the counter-terrorism and operations division of Turkey’s national police, who who now lives in the United States and teaches courses in national security and law at George Mason University (and is accused of being part of the FETO network, which he denies). Yayla explains how Erdogan's purges, before the alleged coup and especially after, have left massive security holes. “In the Ministry of Interior alone after the coup, the president removed 18,600 senior police officers,” he said. Mevlut Mert Altintas, 22, served on police details backing up Recep Tayyip Erdogan’s personal body guards eight times since the failed military coup that rocked Turkey in July, Abdülkadir Selvi, a columnist known for his close ties to the government, wrote in Hurriyet on Wednesday. Alintas, who served on an elite Ankara riot unit for two and a half years, was part of the second tier of security at those events. Is this a promotion? It's said he did this same security job before - once in 2014, once in 2015, and then eight times in the second half of 2016. Post-coup he should be extra-carefully picked to help defend against alleged Gulen plotters. Now they say he was one all along. But none of the suddenly-obvious clues emerge before and raised enough suspicion to revoke that clearance. The alleged FETO traitor “provided security for Erdogan” repeatedly, but never tried to assassinate him. Did the first tier of security prevent him every time from taking a shot at the Gulenist's main enemy? Or did he actually like Erdogan? Tarek Fatah noted the shooting was: "eerily similar to the assassination of Pakistani governor Salman Taseer by his jihadi police bodyguard in January, 2011." But this time, the jihadi police assassin never did kill his ward - he was trusted and indeed protected by the Turkish state up to the moment he assassinated Russia's ambassador instead. 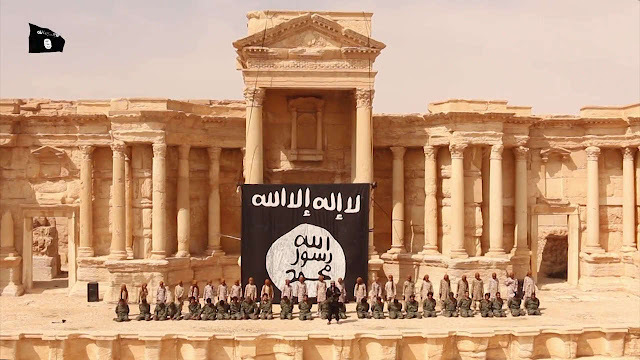 Did John Kerry collude with ISIS to capture Palmyra? ISIS terrorist execute prisoners in Palmyra theater in 2015. 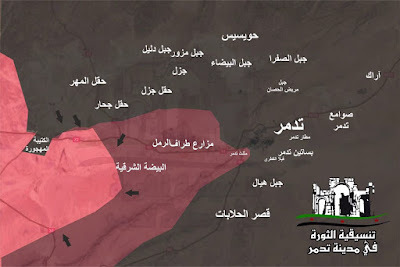 Map of Palmyra as published by pro-ISIS Twitter account. Was phosphine used in the Ghouta Chemical Massacre? I have always maintained that the alleged "sarin" attack of August 2013 never happened. Instead, hostages were gassed in cellars throughout eastern Ghouta. The chemical agent used has been a mystery. I have assumed it was mainly chlorine, but not all symptoms match. 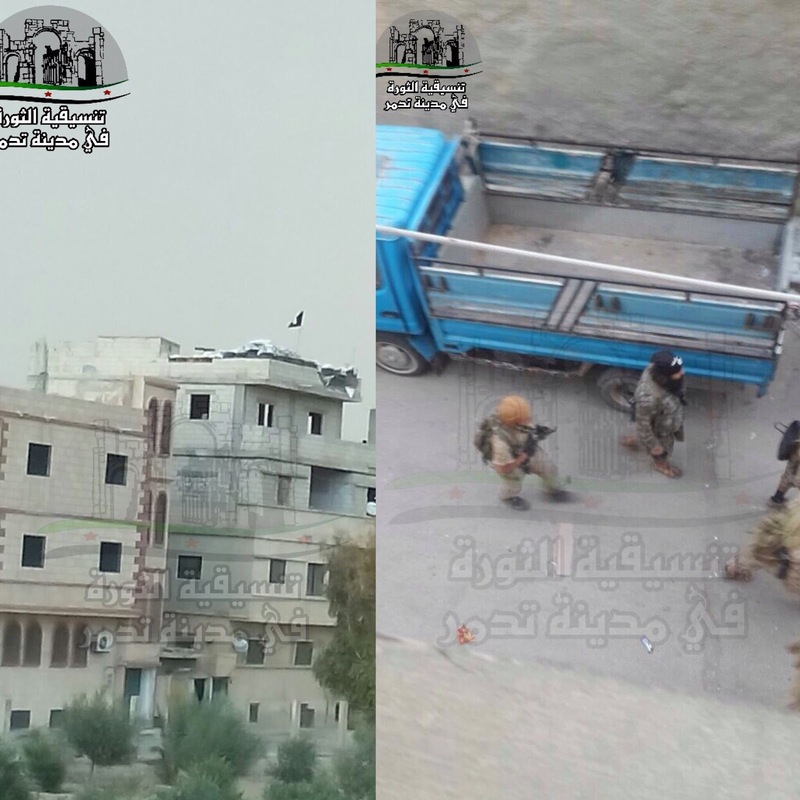 Lizzie Phelan has now published photos and video from a school in eastern Aleppo that had been used as a rebel base. 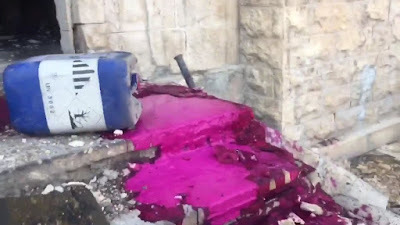 A storage room contained hundreds of liters of potassium permanganate in 10 or 20 liter plastic canisters. We have long suspected that Syrian rebels use potassium permanganate to generate chlorine gas for their gas chambers and for staging "regime gas attacks". The chemical cache also contains barrels of aluminium phosphide under the brand name Detia GAS-EX-B. Aluminium phosphide produces phosphine upon contact with atmospheric water. The primary use of phosphine is as a fumigant in farms and grain silos. 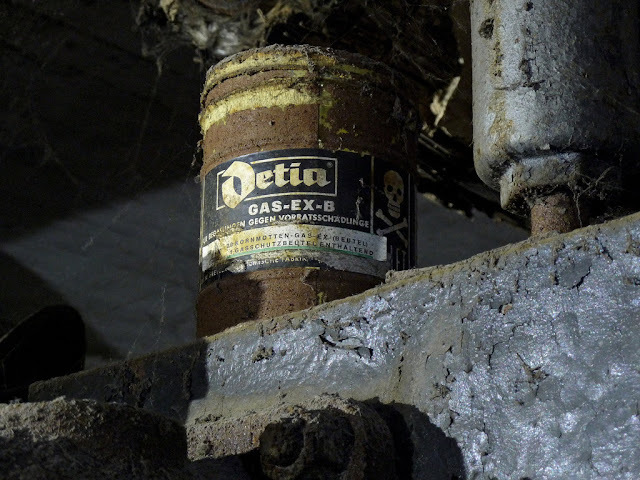 Was Detia GAS-EX-B also used to fumigate rebel prisoners? 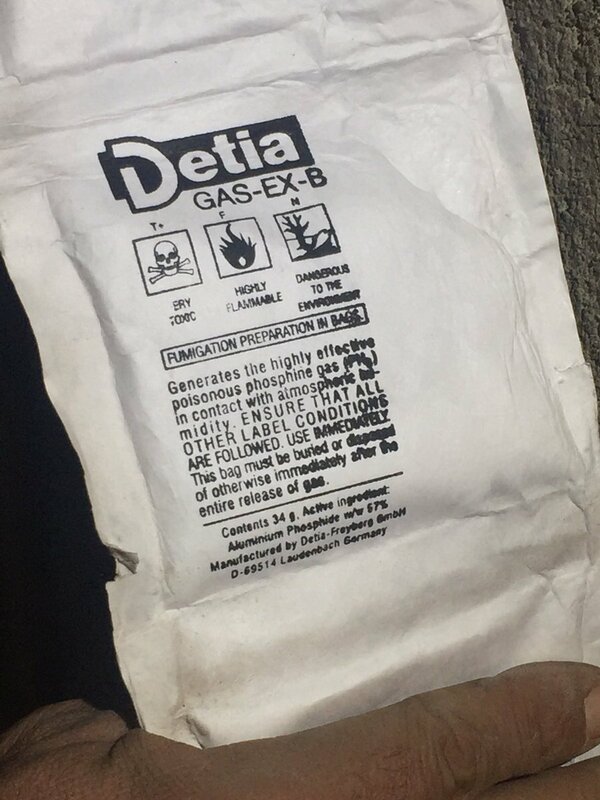 Detia GAS-EX-B is delivered in bags that are packed in metal barrels like the ones seen in on the video. A barrel of Detia GAS-EX-B similar to the one seen on the video. The immediately dangerous to life or health (IDLH) concentration for phosphine is stated as 69,5 mg/m3 where it is only 29 mg/m3 for chlorine. However, only 118,56 mg of precursor chemicals are needed to poison one cubic meter of air to the IDLH level with phosphine, whereas 159,09 mg of potassium permanganate and pure hydrochloric acid are needed for one cubic meter of chlorinated air. The chemicals however come as water solutions, so the total bulk is far greater. A canister of potassium permanganate poured on the stairs of the school in Hanano. Phosphine gas is a cytotoxic compound that causes free radical mediated injury, inhibits vital cellular enzymes and is directly corrosive to tissues. Wikipedia covers the effects of phosphine under the topic of aluminium phosphide poisoning. Poisonings are seen as a problem in India and Saudi Arabia. The school in Hanano in eastern Aleppo may have been a weapons factory. Chlorine and phosphine may have been produced for use in chemical weapons. It is also possible that the were used in situ for executions. 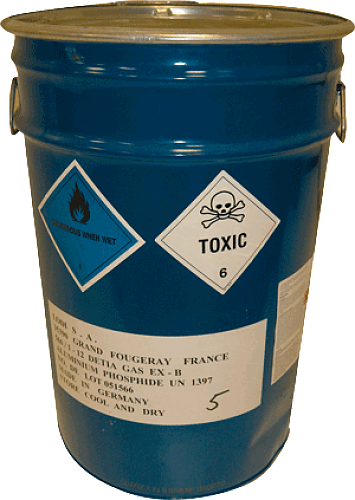 As a fumigant aluminium phosphide is quite similar to Zyklon B. Both are solid compounds that release toxic gasses when exposed to water or humidity. It should not be a huge intellectual challenge for an aspiring terrorist to figure out that aluminium phosphide or Detia GAS-EX-B has uses in a gas chamber. For some odd reason no one has ever before suggested phosphine as the chemical agent in the Ghouta massacre. Other organophosphorus compounds have been suggested without much proof. One vital clue may be the smell. 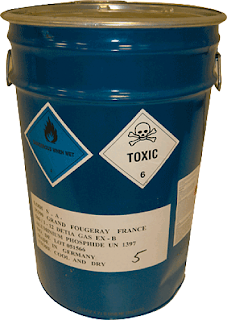 Impure "technical grade" phosphine has a highly unpleasant odor like garlic or rotting fish or rotten eggs. Witnesses in Ghouta reported the smell as unpleasant, rotten like rotten eggs. Did Ghouta rebels use Detia GAS-EX-B to gas their victims in cellars or other gas chambers?